Simonet were a Swiss firm, known world-wide for their beautifully-made, very high quality precision lathes. Apart from the plain-turning (non-screwcutting) versions, usually a version of the Type D102 (which from the 1940s until the 1960s sold in some numbers to watch, clock and instrument-making companies, research departments and various Government agencies), their best-known machine was the DZ-450, a 4" x 18" (102 mm x 450 mm) backgeared, screwcutting lathe. Based closely on the design of the Schaublin 102 (all accessories are interchangeable, though the spindle on the Simonet, is different at M38 x 2.5 mm) it was fitted with a "single-lever" operated oil-bath backgear assembly equipped with hardened gears. Taking W20 (20 mm shank) collets, the hardened, ground and lapped headstock spindle ran in plain bronze bearings and was capable of sustained high speeds with great reliability. Like many other Precision lathes the Simonet's headstock cone pulley had its smallest diameter by the spindle nose - so allowing the front bearing to be increased in size and surrounded by a greater mass of supporting metal. Two or three rings of indexing holes were spaced around the face of the pulley's end flange with a single indexing plunger, mounted in an eccentric holder, to engage them. 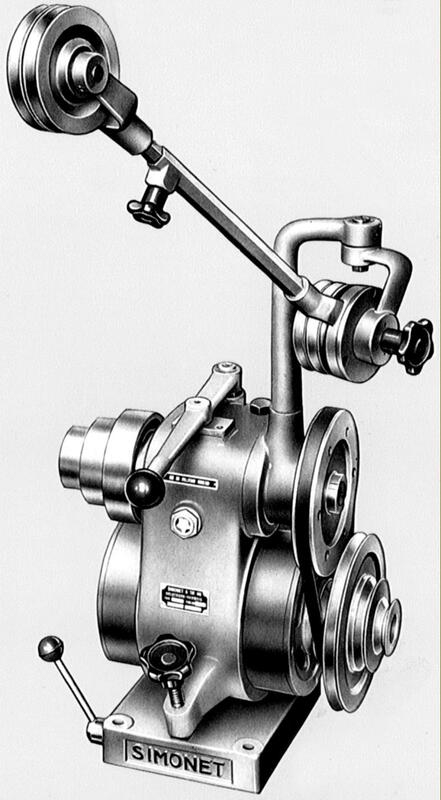 Simonet's compact, well-engineered and clutch-equipped bench-mounted countershaft assembly was used on all their lathes, the device containing a two-speed, oil-bath gearbox driven by an enclosed V-belt from a 2-speed motor built into its base with a flat belt used for the smoothest-possible final drive to the headstock. The drive was equipped with a socket into which could be fitted (at extra cost) an "Overhead" to power toolpost-mounted high-speed grinding and milling heads, the drive being by a 3 or 4-step V pulley connected to an extended gearbox shaft. Some versions of the countershaft unit were equipped with neat, cast-aluminium covers to hide the various pulleys while other were supplied naked and unadorned. The combination of a 3-step headstock pulley with the two-speed countershaft and two-speed motor produced 24 speeds spanning a remarkable 14 to 2500 rpm or, optionally, with a cheaper single-speed 1500 rpm motor, 12 speeds from 22 to 2080 rpm. 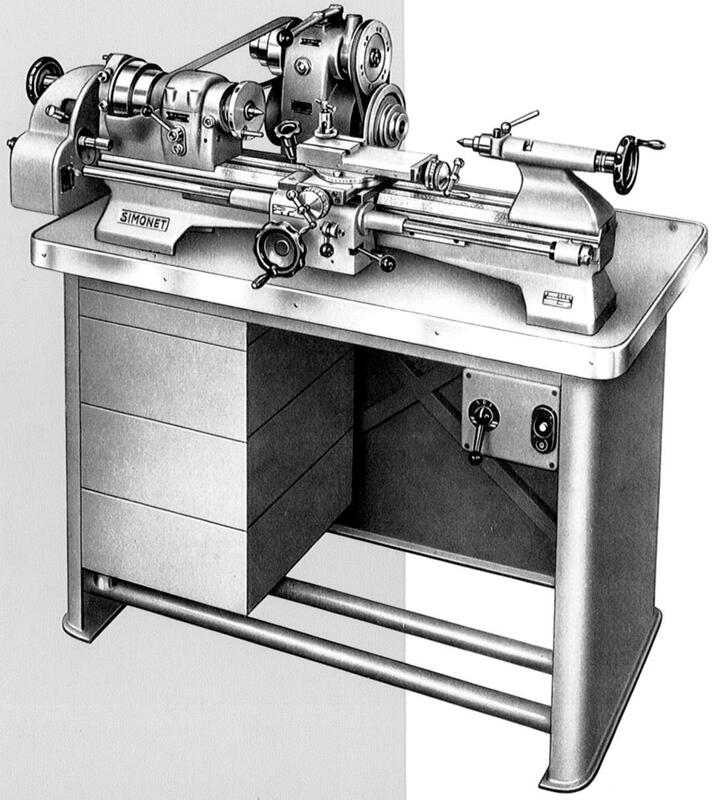 Some lathes were equipped with a single-speed, 3000 rpm motor - in which case the speed range was 28 to 2750 rpm. The bed was hardened and ground and the carriage fitted with automatic longitudinal disengage and power cross feed. The swing over the cross slide was 5.125" (130 mm) and both cross and top slides had the same travel of 4.75" (121 mm) The tailstock, in the best tradition of Swiss precision lathes, was fitted with a hardened barrel - but only an inadequate No. 1 Morse taper; at least the barrel was given was a properly-engineered clamp, not a crude split in the casting which was a hallmark of some contemporary Schaublin models. Screwcutting was by changewheels - there was no optional gearbox - of which 14 were included in the basic set - allowing 29 English threads from 5 to 112 t.p.i (and 24 metric threads from 0.05 to 4 mm pitch) to be cut; the drive from headstock to leadscrew was through a conventional tumble-reverse mechanism. Fabricated from sheet steel, the stand was of very heavy construction and fitted with a "Urphen" top measuring 27.6" x 47" (700 x 1200 mm). The space required to house the lathe was: 53" length x 35" breadth x 50" height (1346 mm x 889 mm x 1270 mm) the approximate weight with bench and drive unit being 685 lbs. In 1982 the basic lathe, with motor-drive unit and stand, cost nearly £5000 - some five times as much as a contemporary Myford Super 7 to a roughly similar specification. 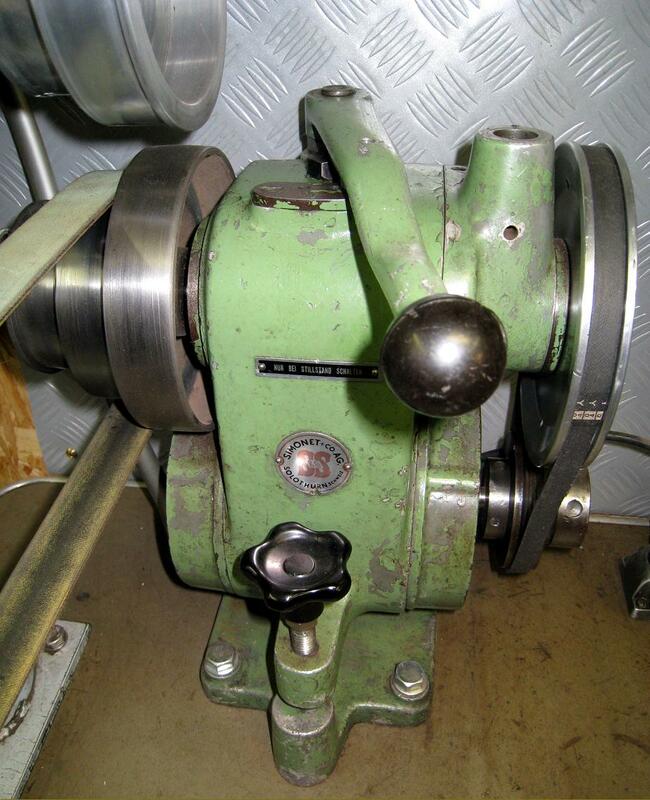 Besides the screwcutting model, other versions of the lathe were offered: the DDA-102 was a semi-automatic second-operation machine, the DC-102 a plain-turning toolmaker's lathe and the DRA-102 an automatic capstan. One Simonet lathe the writer handled was remarkable not only for the usual Swiss precision and superb finish, but also for its leather-upholstered seat which swung out on an ingenious mechanism from within the stand's centre section. When tackling very fine work sitting down to the task had long been accepted as producing the best results, though in some cases it could have interesting consequences. As a young boy, during the late 1950s and on a tour round the then English Steel Corporation gun-turning department, the writer was startled to see the operator of the largest lathe asleep in a wicker chair propped up on the (giant) cross-slide. It was explained that, as the cut took four hours to complete, the management were quite content for you to relax, providing that you neither dropped into the mechanism (and so caused a delay whilst your remains were extracted), or failed to wake up when the "tone" of the cut changed. In the latter case, an adjustment to the setting of the cutting tool was made with a 40 lb sledgehammer, kept close to hand..
With its automatic spring tensioning of the drive cord, and socket mounting direct into the top of the countershaft unit, the Simonet overhead drive unit was especially well designed and very simple to set up. Backgeared headstock No. 518 with quick-release, lever-operated collet closer and changewheel drive - via a tumble reverse mechanism - to the screwcutting leadscrew. On top of the left-hand headstock bearing can be seen the eccentrically mounted plunger which engaged two (or three) rings of indexing holes formed in the end flange of the headstock pulley. Vertical Slide (No. 250) fitted with the Milling Head (No. 245). The head could be driven at speeds up to 3000 rpm and took W12 collets.